Prepare to swoon ... an intoxicating Tomato Cobbler, a lake of jammy tomato and tomatillo below; herby islands of cornmeal biscuits on top; small boats of goat cheese tucked between. Easy enough for a weeknight but worthy of a special occasion. A definite "must" for tomato lovers in the late waning days of summer. Add a salad for a Meatless Monday meal or steaks from the grill for a Weekend Feast. Summer Gorgeous! Season Change. By calendar, it started mid-August with the first-day walk to school with my favorite first graders, their twin-boy shoulders somehow wider and more square as if readying themselves for the Grade One of Life. By weather, St. Louis was blessed with an entire week of unseasonably lovely-cool, windows-open September-in-August days. And by behavior, the local wildlife is girding for winter, the neighborhood deer and turkeys and just today a flock of Canada geese feed in Dawson Field across the way. In the kitchen, season switch occurs more subtly, first with an openness to soup, still summer-light but warm not chilled; substituting eggplant for summer squash and plums for peaches; then finally, the irrefutable sign of the last days of summer, tomatoes gently warmed not in sunshine but in a skillet, pushing aside quick-chopped raw tomato salads. For some years, I've made a tomato cobbler at this very-same seasonal moment. Tomato cobbler, it calls to me. Is it the light? The absence of frog calls at night? The deafening cicadas? Somehow, it's just time. No other time could be so right as this brief window of late August-early September. But until last year, no Tomato Cobbler recipe struck me as just right. One after another just seemed too complicated – too heavy, too rich – for late-summer. But now? I've made this particular Tomato Cobbler four times now, most recently just last week when we sat outside with friends for an impromptu weeknight supper. Good friends, good wine, good conversation – and one incredible Tomato Cobbler. It's time, Tomato Cobbler Time, that is. A quick note. The recipe "writes" longer than it "makes". It's simple, really. Just make some biscuit dough and pop it into the freezer. Cook some tomatoes. Nestle the biscuits onto the tomatoes and bake awhile. Add the goat cheese and bake awhile longer at higher heat. That's it! It's really a "summer easy" recipe. Make it once and you'll be set. Mix and freeze the unbaked biscuits at least a couple hours before putting the cobbler into the oven. CORNMEAL BISCUITS A little mise en place really helps here. First, put the stick of butter in the freezer while assembling the dry ingredients. While you're at it, chill the a box cheese grater. (Why? See ALANNA's TIPS.) Get out the buttermilk. Sprinkle flour on a clean work surface and get out the rolling pin. Find something that will hold the biscuits for freezing, I use a plate that fits into the freezer's ice bin. In a large bowl, combine the flour, cornmeal, sugar, baking powder, salt and herbs. Grate the butter on the large holes of a cheese grater onto a sheet of waxed paper, dump the butter into the dry ingredients. Working quickly from this point forward, use your fingers to gently toss the flour and butter until butter is fully distributed and all the small bits are coated with flour. Add 1/4 cup buttermilk, toss with your fingers or a meat fork until a dough forms, adding extra buttermilk if the mixture remains a little floury. With your hands, gently press the dough to form a big clump. On the floured work surface, gently press the biscuit dough to flatten slightly then use a rolling pin to evenly flatten the dough, keep it as thick as you can, eyeball the size for eight biscuits. Use a biscuit cutter (see TIPS) to cut eight biscuits. There will be scraps; if you like, gather them up and cut another biscuit or two, these can be frozen to bake later for breakfast some time soon. Put the biscuits on a plate, to avoid sticking, they shouldn't touch one another. Freeze for at least one hour. TOMATOES In a ten- or twelve-inch cast iron skillet, heat olive oil until shimmery. Stir in tomatillos, let soften just a bit, a couple of minutes. Stir in the tomatoes, sprinkle the top with sugar, salt and pepper. Let cook, stirring occasionally, until juices release. Bring to a boil, stirring often. Do taste along the way, adding salt to taste. Reduce heat to maintain a simmer, let simmer until juices are mostly absorbed but you do want to leave some liquid for the biscuits to soak up! This can be made ahead of time and left on the stove off heat for a couple of hours; if longer than that, transfer out of the cast iron to store in the fridge until ready to bake the cobbler. TO FINISH Heat oven to 350F/180C. Arrange frozen biscuits on top of the Tomatoes, brush biscuit tops with the egg wash. Bake for 25 minutes. Increase oven temperature to 450F/230C. Place bits of goat cheese between the biscuits, pushing into the tomato mixture if needed. Return to the oven for 10 minutes or until biscuits are dark-gold in color. Serve hot from the oven. Savor. GRATE THE BUTTER? Really! I've been grating very cold butter for pie crusts, biscuits and scones for a couple of years now. It really works! No more need for a pastry cutter or a fork or messy fingers to get to those "pea-size crumbs". This is the fastest/easiest way to yield consistently sized pieces of butter without letting the butter get warm. FREEZING THE BUTTER? The butter grates more easily when it spends just ten or so minutes in the freezer just before grating. Any longer, it gets too hard to grate. I also put the grater itself into the fridge, if there's room in the freezer, that would work too! BISCUIT CUTTER Yes, it really makes a difference. You can use a glass in a big pinch but a biscuit cutter is cheap, takes up a small amount of space AND most of all, has the special sharp cutting edge which allows the biscuits to rise higher. NO BISCUIT CUTTER? I think you could freeze the un-cut rolled biscuit dough, then brush it with the egg wash and cut into small pieces to scatter across the top of the tomatoes. The one downside? A fixed number of biscuits suggests portion size, important for a rich dish. Without that? I, anyway, could inhale the entire skillet, perhaps not at once but over the course of a couple of days. HOW MANY BISCUITS? I usually do nine biscuits, it looks better in a round skillet, one in the center, eight around the edges. But I can also imagine using fewer biscuits, five say, for a higher proportion of tomatoes:biscuits. BISCUIT TIMING You can make the biscuits ahead of time by a few days or even weeks to have on hand whenever you've got a yen for Tomato Cobbler. Do freeze the biscuits on a plate or something so they don't touch one another but after they're frozen, put a sheet of waxed paper between the biscuits, slip into a freezer bag, remove the air from the bag as best you can, then freeze until ready for the oven a few days or weeks later. BISCUIT COLOR The photo I chose depicts quite-dark biscuits, they did get quite dark in that particular Tomato Cobbler. But every other Tomato Cobbler? Not that dark, more the dark side of golden. NO CAST IRON? So sorry! :-) But seriously, it's not required. 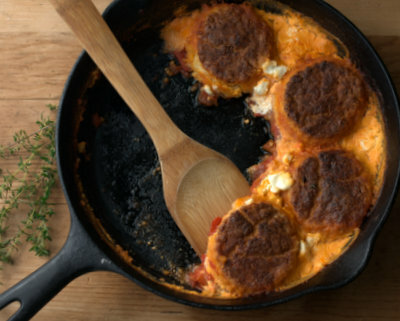 Just cook the tomatoes in another oven-safe skillet. Or if you prefer, cook the tomatoes and transfer them to a glass or ceramic baking dish, even a deep-dish pie pan or hmm, a quiche pan. PLAYING AROUND Fresh corn would work beautifully here with the tomatoes, so would bits of bell pepper. In fact, this weekend I plan to make a liquid-y version of my very favorite Ratatouille and top it with biscuits. LEFTOVER REPORT Leftovers? What leftovers? Tee hee. Definitely best straight from the oven. Question. I see 3 ounces of goat cheese listed in the Tomatoes, but do not see it added in. Or is all 6 ounces added with biscuits? Going to make for dinner. Rose ~ Thanks for your eagle-editing eyes and for letting me know. FIXED! But for the record, I use just 3 ounces goat cheese (though Leite’s Culinara uses 6) and it gets tucked in between the biscuits just before that second blast of heat in the oven. Hope you love it! Rose ~ How’d it go? John ~ The time for Tomato Cobbler is now! Go for it! I can't tell you how awesome this recipe was. I used green tomatoes instead of tomatillas since they were in the garden and whole wheat flour. Awesome. Y’know, I meant to mention that! I don’t have a problem with cast iron and tomatoes if they’re cooked briefly and served right away -- but DO if the tomato-based dish is stored in cast iron. Off to update the recipe, so glad you chimed in!